For decades major companies have been coming out with skincare products that promise a lot but deliver little at a great cost. Unfortunately the focus has been on branding and not the quality of ingredients. The way we see it, Earth has been doing the research and development for millions of years. So why not trust in what nature has generously produced over the synthetic chemicals coming out of the cosmetic industry? Thankfully organic, cruelty-free and natural beauty is on the rise. Here we will discuss everything one should know about clean beauty swaps in order to make the switch to organic, green beauty. Let’s start with cleansers, as any good skincare routine does. There are some popular bar soap companies that claim they do not test on animals, yet don’t display any cruelty-free certifications on their website. It may not seem like a big deal, but we believe in being transparent with our customers about our entire process. This is part of the reason we became certified cruelty-free by PETA and certified organic through EcoCert. 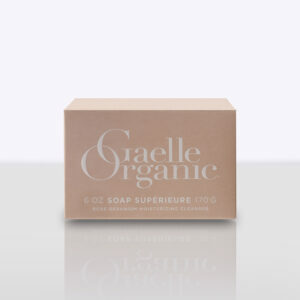 Additionally, many of the primary ingredients of well known bar soap brands are much more drying than the nourishing oils that compose our Soap Supérieure. For a healthier clean, opt for either our classic Soap Supérieure or our Soap Supérieure Rose Geranium for sensitive skin. Toners are an important step to a beauty regimen as they help to prepare the skin for the proper ph condition. Watch out for water-based toners that contain alcohol, parabens and fragrance—all ingredients that can disrupt the balance of a healthy complexion. For a healthy, greener option, try our alcohol-free Toner Supérieure. It contains organic witch hazel, aloe vera, apple cider vinegar and rose water to refine pores, calm breakouts and refresh the skin. With any skincare item, you want to make sure you can recognize these first five ingredients as they are what constitute the majority of the product. A brand may advertise the use of beneficial botanicals such as Pomegranate, but the top ingredients may be C12-20 Acid Peg-8 Ester, Caprylic/Capric Triglyceride, Cetearyl Alcohol and Dimethicone. In addition, many popular brands still reportedly test their products on animals, so it’s important to always do your research. Crème Supérieure is perfect for those looking for the ultimate moisturizer without exposure to animal cruelty, alcohol or synthetics. Our top five ingredients include Aloe Vera, Jojoba oil, Sesame oil, Apricot Kernel oil and Evening Primrose oil all from organic farming. Exfoliants are excellent products for encouraging healthy skin cell turnover and revealing a healthy, fresh complexion. Unfortunately many products on the market are more abrasive than they need to be, leading to sun sensitive, damaged skin. For instance, exfoliants containing walnut shell pieces can cause micro tears in the skin. They may also contain a variety of other comedogenic ingredients including alcohols, synthetics and fragrance, which do more harm than good. Instead, opt for a product like Exfoliant Supérieure—an organic exfoliant that utilizes Breton Sea Salt and Willow Bark extract to gently slough away dead skin cells while restoring critical moisture to the skin. Even brands with objectively cleaner ingredients than some of the previously mentioned, may still include some questionable ingredients in their products. Masks advertised as formulated without parabens, phthalates or sulfates may still contain dimethicone—a silicone-based polymer that traps dirt, bacteria and impurities on the skin. Masque Supérieure is a luxurious sea treatment mask designed with sea minerals and extracts that delivers quality, organic results. All in all, products containing alcohols, chemicals and synthetics with unpronounceable names often cause more harm than good in the long term. We believe informing our customers provides them with the knowledge to make educated decisions when purchasing skincare. This is why we are dedicated to promoting organic, cruelty free practices and practicing full transparency with all of our product’s ingredients. So next time you find yourself shopping for beauty products, we encourage you to do your best to choose natural products sourced ethically and responsibly. The efficacy of the ingredients provided by nature speak for themselves. Hi Natasha, thank you for taking the time to contact us about a potential collaboration. Please send me at email at moorealkern@gaelleorganic.com where we can discuss a details further.